This is the first game in the Half-Life series. 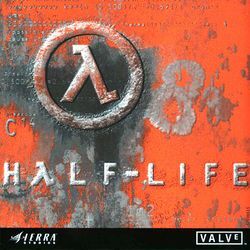 For other games in the series see the Half-Life category. Half-Life was developed by Valve Software and was released on November 20, 1998 for Windows. Half-Life raised the bar for FPSes, combining action, amazing graphics (for the time), and exciting linear gameplay. The storytelling in the game is revealed level-by-level through several scripted sequences which places the player in new situations. Half-Life has won 50 Game Of The Year awards from major publications and is considered a marvel in gaming. You are Dr. Gordon Freeman, a theoretical physicist who works at Black Mesa, a secret government facility located in New Mexico. You and your team of scientists are eager to try a new experiment, and you volunteer to be in it. You take a hazard suit and head down to the test chamber. Everything is going well, but a major problem occurs in the experiment, and now you and the other survivors must escape from Black Mesa alive. Inside cover of above box. The iconic opening scene of the game. Platinum Collection (v1) box, front. Platinum Collection (v1) box, rear. This page was last edited on 18 March 2017, at 23:23.